I’ve only ever been in the vet school once, to deliver an invitation for a wine and cheese event to an alum of my fraternity house who worked as a researcher at the vet school. When it came to getting photos, I would just take advantage of my Bradfield perch, take my photos, and that was that. The vet school is not unlike the rest of the school in that it’s been built in spurts. The original vet school was in James Law Hall, where Ives Hall stands now (and even prior to that, it shared space in the north wing of Goldwin Smith Hall, the old dairy science building). The vet school moved further east with the construction of Schurman Hall in 1957, and expanded with the Vet Research Tower in 1974, the Vet Education Center and Vet Medical Center in 1993 and 1996, and the East Campus Research Facility and Vet Diagnostic Lab in 2006 and 2010 respectively. Essentially, the vet school is like many human hospitals, a mish-mash of additions and new wings/buildings, incoherent and even incompatible. 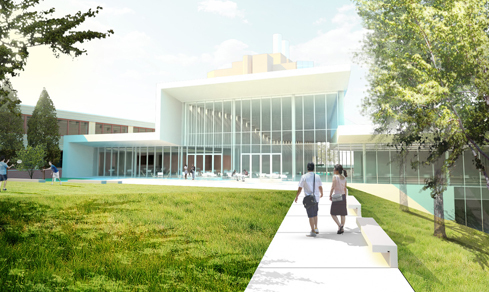 The completion of the the VDL building left a large amount of vacant space in Schurman Hall that was difficult to repurpose, hence the approved plan – demolish 68,000 square feet of space, build 65,000 square feet of new space, and renovate 33,000 square feet of existing space, to be done in two phases with a combined cost of $63 million. Given those stats, it seems like a misnomer to call it an expansion, but one of the effects of the reconstruction will be to increase the number of matriculating vet students in a year from 102 to 120 – and given Cornell’s #1 vet school ranking, they will not be lacking in applicants. Over four years, you have 72 more professional students – you’re welcome, Ithaca landlords. Among the details, the old auditorium will be torn down, and in its place comes the new Flower-Sprecher library, two new lecture halls, a new dining hall, large gathering spaces (i.e. 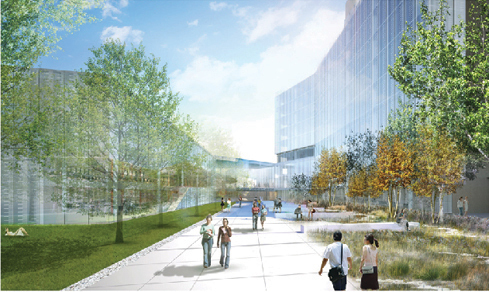 yet another open atrium) offices, an expanded anatomy lab, and a green roof. The architects of this plan are New York-based Weiss/Mandfredi, who specialize in hypermodern glassy spaces. As for the time frame, Phase I, which comprises the tear-down and new construction, will start in April 2014 and be completed in a 12-month time frame. Phase II, the renovation component, will commence at that time and proceed towards a tentative completion in October 2016. I will already be beyond my 5-year reunion, so that kinda freaks me out. Straying a bit here, but I’ve heard from my vet school friends that the market isn’t absorbing new grads like it used to, and not at the salaries that it used to. A for-profit school planned for Buffalo was recently cancelled. But, I suppose for the #1 school, these are concerns that the college is reasonably shielded from. Adopting a dog in the next couple years is on my priorities list (if I can ever establish enough of a schedule that makes me feel like I’d have adequate time to love it), so in my totally uneducated opinion, more vets is fine by me. 1. Lansing Reserve is dead. The 65-unit project slated for a wooded parcelnorthwest of the intersection of 13 and Warren Road has been bought out by the village of Lansing, which intends to use the space as a “park”. The project, originally proposed in early 2011, has been beset with issues since the first public meeting, with concerns of traffic and wetland protection and “ruining the unique of [the] village”. 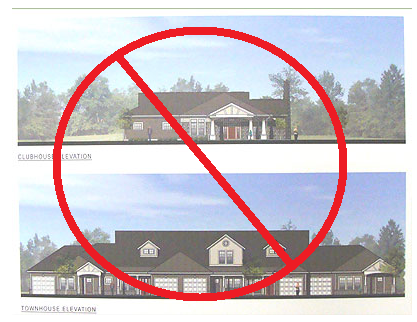 Apart from Wal-Mart, it’s probably the only project I’ve seen proposed in recent years that the locals created their own websites and exaggerated figures/renderings in their efforts to oppose the project. Lansing town and village seemed to have struck an anti-development tone in the past several months, with this and the cancellation of the town’s sewer project (again). 2. Meanwhile, the same two groups that proposed Lansing Preserve are now looking to develop a parcel in the town of Ithaca, on West Hill near the hospital (aka the Biggs property). The town put out a request for bids on the parcel in late summer 2012, which I covered previously. Nothing formal proposed yet, but the project is expected to contain about 60 townhomes in the affordable housing market range (30-90% of local median income). Shades of Lansing playing out here, as the anti-development Ithaca West neighborhood group has been opposed to the sale of the parcel, let alone its development (the reasons cited – traffic and an increase in crime). However, their stance pits them against Ecovillage and their connections, so this should be an entertaining show. Ithaca Builds provides more coverage here. 3. 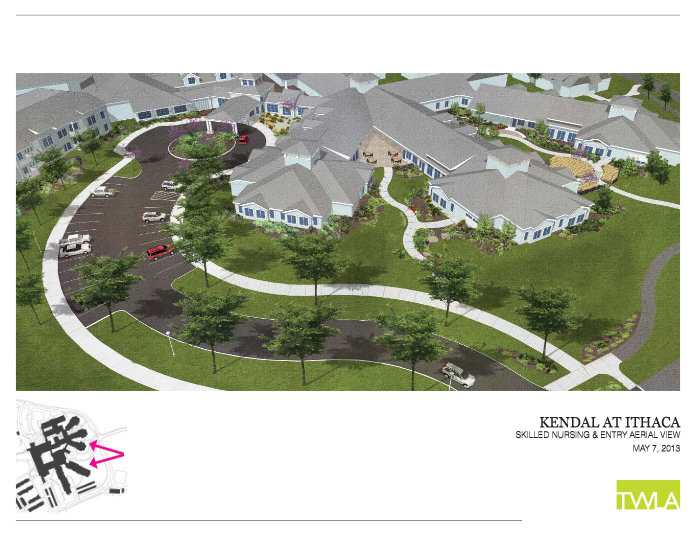 Deep-pocketed retirement facility Kendal at Ithaca is preparing an expansion of its own. The 212 unit (indepedent living) and 71-bed (assisted/skilled care) facility plans to add 24 more indepdent living units (the parcel allows a max of 250) and 13 more beds to its skilled care group. This would be achieved with the construction of a new 2-story apartment building and three new 1-story wings for the reconfigured skilled care space. 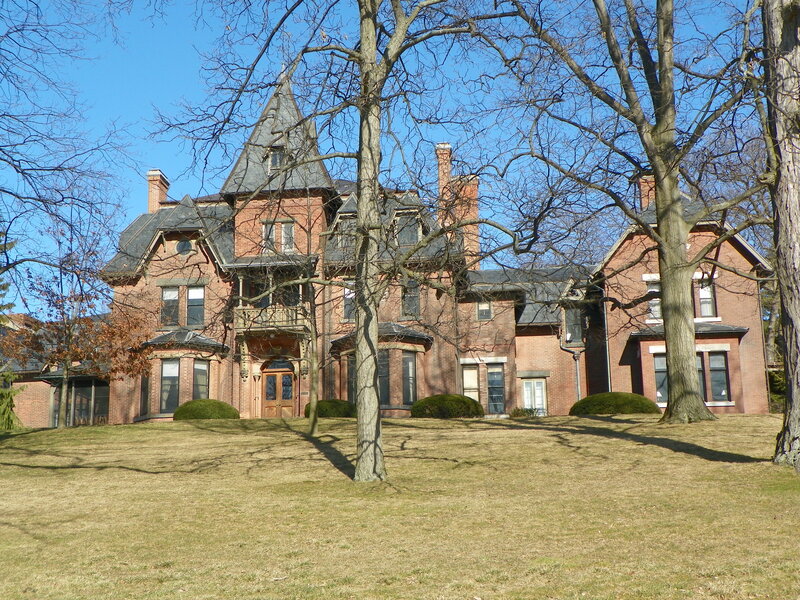 Chiang O’Brien are the architects and the project should be completed in the spring of 2014. Kendal at Ithaca first opened in 1995. to by Cornell-centric readers, the only reason you might care about this is that the facility hosts a sizable number of retired CU faculty/staff. -65+60+24 = +19 units. Well noted.